Info "Show your Wario fan knowledge." Wario 101 is a microgame in WarioWare: D.I.Y. Showcase in Wario-Man's stage. 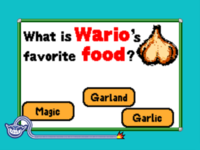 The game asks, "What is Wario's favorite food?" There are various options to choose on the screen; garland, garlic, garage, magic, and marlin. The player has to select garlic to win.